Who is available to answer questions about my child? What happens if I need to be seen and your office is closed? Will I be able to see the same doctor every time? Who will see my newborn or sick child in the hospital? How long is the waiting room time? Do you call in prescriptions? How long do I have to wait for an appt? How often does my child need a routine check-up? We are open Monday through Friday from 8 AM to 4:30 PM. We do offer walk-in hours from 8 AM to 10:30 AM, Monday through Friday.Our phones are answered from 8 AM to 12 noon and then from 1 pm to 4 pm, Monday through Friday. We do close the office and turn the phones over to the answering service from 12-1 pm each day.We do not have regularly scheduled office hours on Saturday. 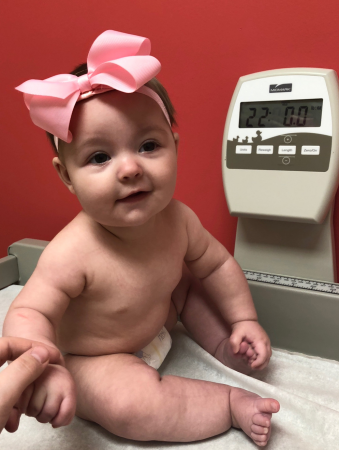 However, if your child needs to be seen for an acute illness there is usually a physician from our office or another local pediatrician in our call group that will be available to see your child. The physician location and office hours will change from week to week so please call our office at (205)333-8222 and you will be directed to the appropriate clinic. There is no walk-in clinic on Saturdays. From 8 AM to 12 noon and from 1 PM to 4 PM, we have telephone advice nurses. Often they will answer immediately when you call, however, if call volume is high, you may need to leave a message. Phone calls are typically returned within 1-2 hours but in the winter months when call volume is extremely high, it may take longer than that. If your call is urgent, we ask that you hold until a nurse answers. If you need to speak with one of our physicians and would prefer not to speak with a phone nurse, please let the phone nurse know. Physicians usually try to return calls within 24 hours, however, it may take longer during our busy season or if the particular physician is not in the office at the time you call. If you have an emergency, call 911 instead of calling our office.From 4 PM to 8 AM our calls are answered by an after-hours nursing line staffed out of The Children’s Hospital of Alabama. There is always a physician on call so if the nursing line is unable to handle the problem, the physician will be paged. There is a $10 per call fee for after-hours calls from this service. If the problem is minor such as an earache, sore throat, or minor trauma and you feel your child cannot wait until our office opens again, we recommend you visit a walk-in clinic. If the problem is more urgent, we recommend you visit the DCH Regional Medical Center Emergency Room. If you are having difficulty deciding where to go but you do not feel it is an emergency that requires 911, please call our after-hours nursing service. If you have not heard back from them within 1 hour, please call again. If you have an emergency, call 911 instead of the after-hours nursing service. For routine check-ups and other non-urgent visits, we try to schedule you with your doctor of preference. However, in order to facilitate timely appointments, if the doctor you prefer is not available, we will offer an appointment with another doctor. For urgent or same-day sick appointments, we will schedule you with the doctor that can see you first. If you have a preference, please let our phone nurses know and if that doctor has an appointment available we will schedule you with him/her. All of our doctors are on staff at DCH Regional Medical Center. There is typically only one doctor making rounds each day, so you will see her. For newborns, all you have to do is specify Tuscaloosa Pediatrics or the specific physician name for your child and he/she will be seen within 24 hours of delivery. If your baby is born at Northport DCH, he or she will be seen by the Northport DCH hospitalist who takes care of our patients in the well baby nursery.If your baby is born over a weekend, it is possible you may see one of the other local pediatricians we share call with. These pediatricians are Dr. Bruce Petitt, Dr. Elizabeth Cockrum, Dr. KaiCee Richardson, Dr. Phil Phillips, and Dr. Sudha S. Bennuri.Our pediatric patients who require hospitalization at DCH are cared for by the University Medical Center pediatricians. They are assisted by Family Practice residents and UAB medical students. For more information, please see the letter in our news feed. IF YOU HAVE AN EMERGENCY AND NEED TO GO DIRECTLY TO THE EMERGENCY ROOM, PLEASE GO TO DCH REGIONAL MEDICAL CENTER ER. NORTHPORT DCH DOES NOT HAVE A PEDIATRIC FLOOR OR PEDIATRIC NURSING STAFF. This depends on the time of year (winter is busier), time of day (after-school hours are busier), and severity of illness of patients prior to your appointment. If we have an unusually sick child, your wait may be longer and we will try to inform you of this situation. We respect your time and will try to get your visit started as close to your appointment time as possible. Yes. However, there are medications such as oral antibiotics, that we do not typically call in without an office visit. ADHD medication prescriptions will need to be picked up and signed for once monthly. We do have a prescription refill line and encourage you to leave a message when you need a medication refill. Refills are usually called in within 24-48 hours. We do not call in controlled substances – in the instances where these are needed in pediatrics, an office visit is required first. For sick visits, we try to see you on the same day you call. However, in the winter when the clinic is busiest, you may be offered an appt the following day for non-urgent problems. Well appointments are scheduled with a specific provider, so the wait times will vary per provider. Most likely an average of 6 weeks. We would prefer to schedule Sports physicals as far in advance as possible but understand the often last minute need for these and will try to work with you as best we can. For the first two years of life, children will be in for check-ups every 2-3 months. After this, they come in once per year. At this time Tuscaloosa Pediatrics is accepting only newborns with private insurance (Blue Cross, Allkids, United, Aetna, Tricare, etc.). We are not accepting any Medicaid patients or transfers at this time. Exceptions may be made for siblings of current patients so please contact us in that situation.